The Royal Oak Foundation recently presented the National Trust with a grant in the amount of $1,525,000 raised from its 2016-2017 appeal: “Keep Churchill at Chartwell.” Royal Oak’s grant is part of the National Trust’s overall £7.1 million (which translates to over $9 million) appeal that will enable the Trust to purchase important personal objects once belonging to Sir Winston and keep them there in his beloved home. Educational initiatives involving these objects are also being created. These items include Churchill’s Nobel Prize in Literature, his own paintings and memorabilia. Royal Oak is grateful for the major gifts that we received from generous Board members and from several patrons; donations from private foundations and responses to special appeal solicitations. All of these contributions will help the Trust to ensure that some of the most precious personal items of the great wartime Prime Minister can remain in his home for future generations to study and enjoy. 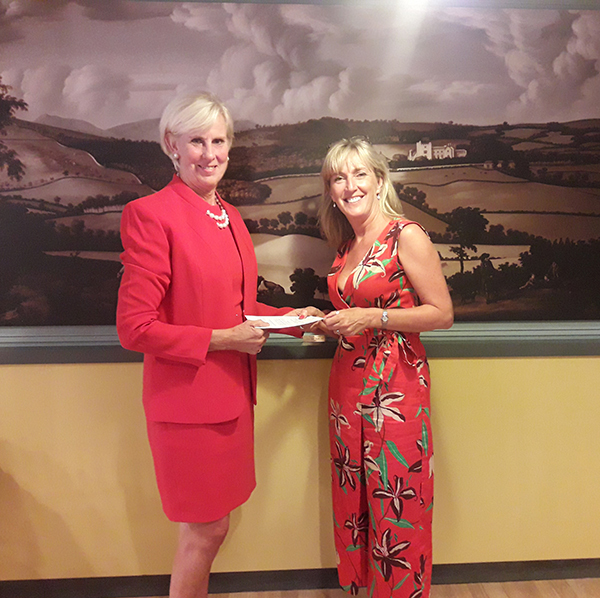 Pictured above: Royal Oak Chairman, Lynne Rickabaugh, (left) presents Hilary McGrady, Director-General of the National Trust of England, Wales and Northern Ireland, with the $1,525,000 grant at a dinner hosted at Sizergh Castle for the Royal Oak Board by the National Trust on September 12, 2018.